The bowl is covered with a celadon glaze. The exterior is plain while the interior has moulded and inlaid decoration of a lotus blossom in the well, three moulded boys amongst lotus flowers on the sides, and an inlaid arabesque border near the rim. The foot ring is glazed and has three spur marks. 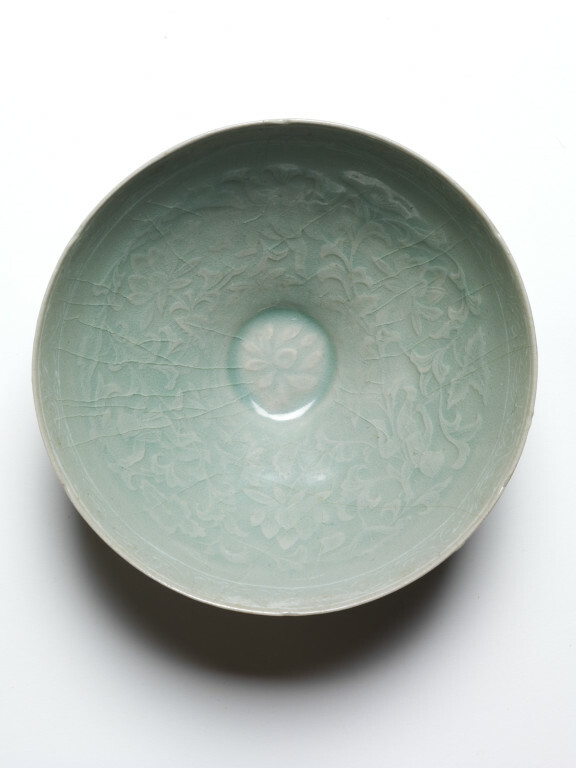 The earliest Korean celadons with inlaid decoration are associated with a tomb of 1150, and so a late 12th century date is suggested for this elegant pale green bowl. The bowl is covered with a celadon glaze. The exterior is plain while the interior has moulded and inlaid decoration of a lotus blossom in the well, three moulded boys figures amongst lotus flowers on the sides, and an inlaid arabesque border near the rim. The foot ring is glazed and has three spur marks. 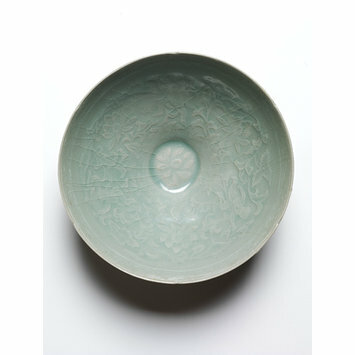 This celadon bowl is glazed a jade-green colour with a subtle gloss. The interior has a scroll band inlaid with white clay below the rim and an impressed design of boys and blooming lotus flowers in a pond. The exterior is undecorated. There are three silica spur marks on the foot. 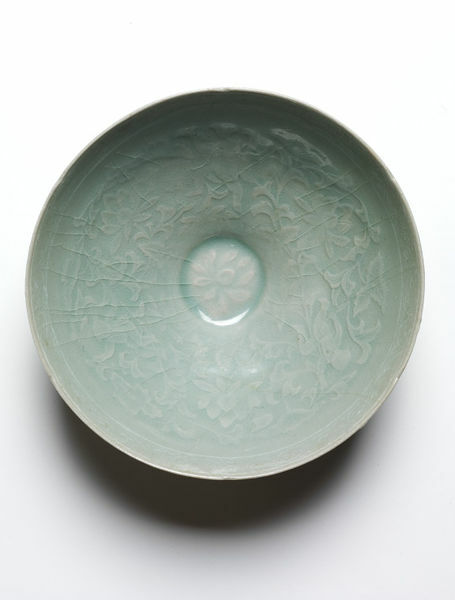 This masterpiece was produced at a kiln in Sadang-ri, Gangjin, in the early 13th century when the inlaid celadon technique, or sanggam, started to be used. Catalogue of the Le Blond collection of Corean ceramics. National Research Institute of Cultural Heritage. Daejeon: National Research Institue of Cultural Heritage, 2013, pp. 58-59.